Trying to get rid of toenail fungus? Healthy nails are possible, and you can do something! Start the conversation with your doctor today to help you regain control of your toenail health and clear up your fungal infection. This Doctor Discussion Guide will help you talk to your doctor about choosing a toenail fungus treatment that's tailored to you. Answer the questions, then use the button at the bottom of the screen to print your results so you can bring them to your doctor. Alternatively, you can show your results on your mobile device during your visit to the doctor's office. Select all signs and symptoms that you have noticed. Your specific signs and symptoms can help your doctor select the most suitable treatment. Check off any of the following statements that apply to you. Your medical history can help your doctor choose the right medication for you. To learn more about various prescription treatment options, refer to Treatment Table. Check off any concerns that you may have about your toenail fungus treatment. If you have a concern not listed here, add it under "Other." This information will help your doctor track your treatment history and decide if any changes are required for your future treatment. What can happen if toenail fungus is left untreated? 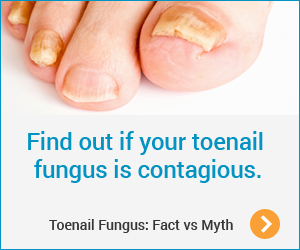 Is the fungal nail infection contagious? Can my family become infected as well? Can a fungal infection spread to other nails or to my fingernails? Will this fungal infection ever go away? What treatment options are available to me? How do they work? What are the risks and benefits of each treatment option available to me? Are there different success rates associated with the various treatment options? Which treatment option do you think will work for me and why? How often and for how long will I need this medication? Will I need to have any medical tests while I am on the treatment?